« Chanos & El-Erian: Can the world accommodate China’s success? This post is a guest contribution by Dian Chu, market analyst, trader and author of the, EconMatters. The Federal Reserve has lost all credibility on Wall Street, and most of the American public with the absolute refusal to recognize the dire effects on asset prices that QE2 has created. But the refusal is part of the problem. It reinforces the wide spread belief of investors that the Fed is out of touch with reality, and that they sit in their Ivory Tower implementing an exceedingly loose monetary policy, with the stated goal of inflating asset prices. The Fed has refused to even acknowledge the possibility (rather than the indisputable facts) that not only have they inflated selected asset prices like S&P 500, the Dow indexes, but they also have inflated asset prices like food, energy, and clothing which would actually hurt the economy and consumers (See Chart). Remember, overall inflation is actually being artificially under-reported by the numbers because housing and wages are not inflating. These are the two actual groups of assets that Americans in reality need the Fed to inflate. But Fed’s policies have been unable to help and seem to essentially be hurting the housing sector, as higher everyday living costs with stagnant wages tend to reduce disposable income and resources that could be otherwise allocated to saving towards a down payment to purchase a house, improving the real estate sector of the economy. Furthermore, since most of these asset prices are priced in dollar, the fed has exported dire and extreme inflationary pressures on an already precariously balanced inflationary picture in the emerging market economies from China to India. It is the proverbial throwing of jet fuel on a barbeque for most of the economies. Yes, Bernanke is right that these countries had inflationary problems before based upon their undervaluing currencies. Nevertheless, this is how their economies have been set up in the global trade role that has been 30 years in the making. These countries just couldn`t revalue their currencies near enough to still keep their role as exporting, cheap labor manufacturers, without sending the entire region into a 10-year depression which would bring the entire world into a depression not seen since the Great Depression. Given the fact that these manufacturing exporting countries cannot meaningfully revalue their currencies, they are basically stuck with an endemic higher level of inflation compared with the developed economies, but it is still manageable. Now, with the US`s persistently loose monetary policies exacerbated by QE2, raising input costs for commodities used in abundance by these manufacturing, cheap labor economies like Oil, Copper, Cotton, and Iron Ore (See Chart), these policies are exporting additional inflationary pressures to these developing economies. This results in making what would be a manageable level of inflation in China of around 3.5 to 4% an unmanageable level of inflation at 5.5 to 6%, and maybe even higher as the full effects of the inflation of commodity asset prices have not yet fully been incorporated and manifested in the Chinese manufacturing economy. Loose monetary policy is dollar negative (printing money, currency devaluation, etc). 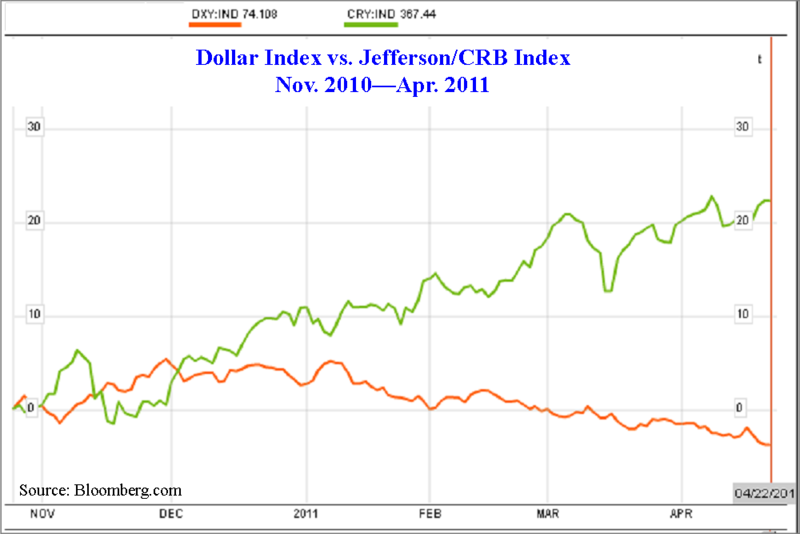 Therefore, put on the following trade: Short the dollar, and go long commodities. This is the famous inflation trade is has been going on and off for the past 10 years by fund managers around the world. This trade has been in the investing 101 handbook for 50 plus years. And the fact that Ben Bernanke never admits to knowing about these trade dynamics in the marketplace, and how his policy initiate of QE2 actually encourages, facilitates and even mandates that fund managers around the world put on this very trade is beyond a rational explanation. In addition, it is even more incredulous of Bernanke and his failure to acknowledge any role whatsoever for the feds function in these higher commodity prices when their stated goal is to in fact inflate asset prices. Whenever he is interviewed about this very question he always uses the standard response that inflationary pressures are not due to the recent Fed policy of QE2. I guess these are assets that the Federal Reserve has expressly forbidden traders to inflate. However, Bernanke also adds that these inflationary effects are transitory in nature–he has been saying “transitory” for over 6 months now. How long does it take for ‘transitory” to become “stuck in the economy, and cannot get rid of without a massive rate hike sledgehammer”? It is starting to sound like a broken record, and it is completely divorced from the facts in the marketplace, or the facts on the ground for those not in the Ivory Tower. It is this main street denial that has reinforced the notion that Bernanke and his dovish colleagues with their incessant soft selling of inflation in their comments regarding inflation questions every week that they are out of touch with reality. This “fed out of touch with reality” notion only goes to reinforce the very “Inflation /Currency Devaluation Trade” causing traders to pile even more capital into shorting the US Dollar and going long Commodities because it is only going to get worse down the line. This is what is referred to as inflation expectations. The fed policies regarding QE2 are not near as damaging for the US Dollar as traders perceptions of the Fed policy of QE2, and judging by the rise in Silver alone will tell you, traders perceptions of QE2 is extremely negative. And that old adage perception is reality takes hold and traders do far more damage to the US Dollar than any actual currency devaluation due to QE2 by going heavily short the currency. Traders and their perceptions right now are what is really hurting the US Dollar and Bernanke has failed to realize this fact. Another interesting question for Bernanke and his Dovish colleagues, and it appears that even the more hawkish members of the Fed are still to dovish in their market comments regarding inflation. Probably because they all are in the upper income bracket on a percentage basis compared with the average US consumer, and are largely immune to the ridiculous six month rise in food and energy prices felt by the average American citizen. The Fed can change all that on the 27th of April with either a cutting short of QE2, or an equally hawkish wording of the fed statement with a nod towards tightening sooner than previously indicated in past policy statement wording. How come at every Speech where there is a question and answer session that you are asked about inflation? Or how come every reporter when interviewing a fed member asks them about their role in causing inflation around the world and how this is contributing to political and social instability in emerging economies? Is this just by coincidence, all these reporters and questions revolving around inflation effects? The answer is that these questions are being asked for a reason, and that alone is a problem for the fed. Another question for Bernanke is how come every other country is worried about inflation, including developed economy neighbor Europe, while the US doesn`t have an inflation problem? It seems the US is the only country in the entire world where inflation isn`t a problem? Does this seem logical? And if it is in fact the case, how long do you think it will stay this way, where the entire globe is experiencing inflation pressures but the US has a “transitory” inflation problem? The problem for the Fed is that this goes beyond current inflationary effects in the economy, but future expectations of inflation in the economy. And none of these are transitory in nature once they get embedded in the psyche of investors and consumers. The only way they were doused in 2008 when they were at these exact levels was a near historic crash in the financial and housing markets. Absent of some similarly extreme deflationary event, inflation and expectations of inflation are only going to feed on themselves and become even more firmly entrenched in the economy, negatively reinforcing investors and consumer’s asset allocation and spending habits. This all becomes self fulfilling in nature, and the real nasty part about inflation is if you don`t head it off early, once it gets even a little momentum, it becomes much more difficult to control and manage. This is where the fed is right now; they are at the cusp of losing control of their handle on inflation with their incredibly dovish stance towards inflation. Bernanke and the current Federal Reserve Board have a credibility problem both with Wall Street traders and the American population. The sooner Ben Bernanke acknowledges his role in causing inflation, the better off we will be in fighting the battle of inflation. The longer the denial routine of “transitory’ responses continues, the increased chance that Bernanke loses what shred of remaining credibility he has on the inflation issue. Then, the inflation battle is essentially lost without equally devastating policy responses that are almost similarly as bad as the inflation effects, i.e., you have to send the economy into a recession with an abundance of tightening measures that completely destroys growth to get a handle on prices. Again, the Fed and Bernanke can change all this on the 27th of April, failure to do so basically dooms Bernanke`s legacy to be remembered by the initial moniker put on him when he initially was chosen as Alan Greenspan`s successor, when he was commonly referred to as “Helicopter Ben”! During his first six months on the job as Fed chairman, he did everything possible to dispel such a label, but he has more than made up for that period during the last six months regarding his outright refusal to acknowledge the exceedingly negative side effects revolving around out of control food and energy prices related to his QE2 Initiative. The average American citizen cannot withstand another two months of “Asset Inflating” on behalf of the Fed, enough is enough, time to cut the QE2 policy initiative short. 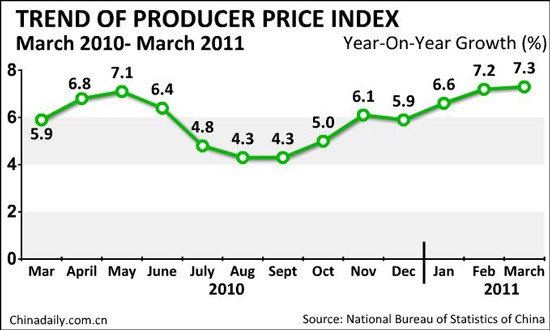 Source: Dian Chu, EconMatters, April 24, 2011.